drsolly: The apprentice is back! This is the only TV reality that I watch - actually, it's pretty much the only TV that I watch, and so does ladysolly. The appeal is the contrast between the monster egos of the contestants and their actual capabilities, although Lord Alan Sugar (I was hoping he'd been promoted to King for this series, or at least Prince) gives them a run for their money. We do love the faces that Nick makes. But you can't really blame the contestants for their egos - I feel sure that the company making the programs A) selects the biggest plonkers they can find, and B) eggs them on to humungous overclaiming of capabilities. For me, the star of the series is this. 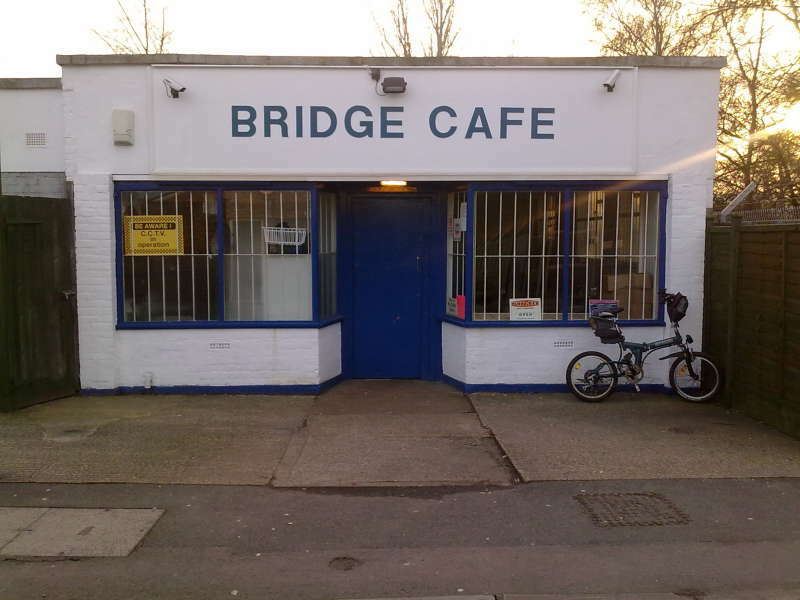 This is where the losers go for tea and recriminations. The bike leaning on it is mine - I made a pilgrimage to it once, but sadly, it was closed. Todays loser (because this show is all about losers, there being one each week) managed to talk herself into the loser's slot, simply by being unable to understand when to close her mouth. A lesson for us all. results in how much further ahead of the rest of us you could be if you didn't give us time to catch you! Yes, but remember two things. 2) The Apprentice starts at 9pm, and ladysolly requires me to be home at 8:15pm each day for supper, so I couldn't be out caching even if my leg were 100%. 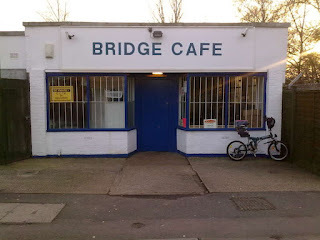 And by the way, I found the Bridge Cafe while I was out caching. There's a cache there.